Starting on the West Side at some time during the night of Oct. 8, 1871, the Great Chicago Fire continued until early in the day on Oct. 10. It carved a swath of fiery destruction that stretched out four miles long and almost a mile wide for a total of more than 2,000 acres of land ravaged. The vast blaze resulted in the loss of around 300 lives, and it destroyed more than 70 miles of roads and 17,000 buildings. When it comes to fire-related disasters in the United States, it was the third-worst conflagration in terms of adjusted monetary cost, with estimates reaching $3 billion in 2008 dollars; however, it also helped redefine the design and construction of modern cities. The conditions leading up to the event created the perfect conditions for a disaster. The city was in the midst of a major drought, and it was living up to the "Windy City" nickname, with strong winds blowing to the southwest. The streets and sidewalks had been constructed using wood, as were many of the buildings. Roofs also featured materials that were ripe for a tragedy, often including extremely flammable materials such as tar. Yet another problem that helped set the stage for tragedy was the fact that there were less than two dozen horse-drawn fire engines for the entire city. The place of origin for the fire was a shed in an alley at 137 DeKoven St., but the actual cause of the fire remains unknown. A popular opinion at the time blamed the incident on a cow owned by dairy farmers Patrick and Catherine O'Leary. The story was that Catherine O'Leary was milking her cow when it kicked over a lantern, which started the blaze. The quick spread of this story came from the fact that she was an Irish immigrant and anti-Irish sentiment was strong at the time. Even though the reporter who first floated the rumor about O'Leary's cow retracted the story, hatred of the Irish kept it alive. The O'Learys were exonerated over a century later in 1997, and other theories arose, such as gamblers on her property who may have knocked over the offending lantern. Regardless of its true cause, the fire quickly spread. Firefighters were alerted to the fire by a city watchman, but they received the wrong directions. By the end of its first hour, the fire destroyed a number of homes in the area before it moved to the business district, then across the river to hit the gas works on the South Side and then the city courthouse. The blaze jumped the Chicago River, spreading to the north side of the city. The fire hit Chicago's waterworks building and destroyed it as well, eliminating the city's access to its water supply. Rain finally came at night on Monday, helping to put out the waning blaze. In the immediate aftermath of the fire, crime skyrocketed in the form of riots and looting. Furthermore, 100,000 residents were left homeless, and people sought to take advantage of the disaster through price-gouging for necessities. The period following the fire would have been a prosperous time for a Chicago personal injury lawyer or property law attorney. Martial law was declared to rein in the crime, and the city began to set price controls. Meanwhile, donations came in from other parts of the country and around the world, including $450,000 from New York City and firefighting gear from Milwaukee and other cities. Food, clothing, and other materials poured into Chicago, both from governments and private organizations. Chicago began a large-scale recovery from the fire almost immediately. While some felt that the fire was a result of society's failure to respect traditional morals and lifestyles, others saw it as an opportunity to examine how a city needed to be run. This included re-examining fire safety laws and building codes as well as emergency response tactics and technology. During the ensuing reconstruction efforts, Chicago revised and improved its building codes and firefighting tactics through a series of ordinances and developed a more advanced firefighting force as a result of the research that occurred after the fire. The city also grew from 324,000 to more than half a million in population in less than a decade and became a major economic force by the turn of the century. 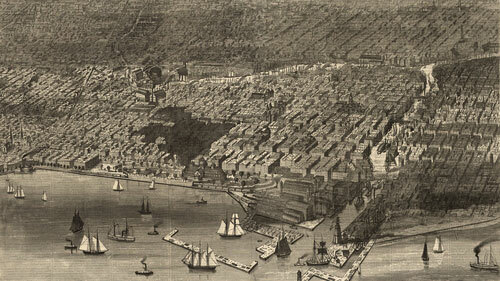 The Chicago Fire of 1871 and the "Great Rebuilding"
What Started the Great Chicago Fire?